David Pajuelo, Norberto Gonzalez-Juarbe, Uday Tak et al. 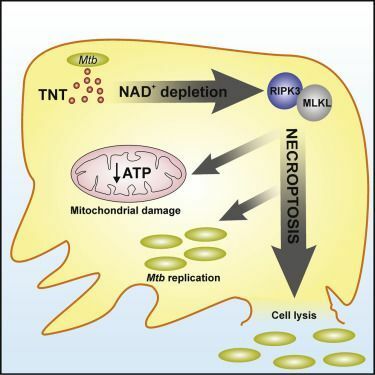 NAD+ Depletion Triggers Macrophage Necroptosis, a Cell Death Pathway Exploited by Mycobacterium tuberculosis. Cell Reports, 10 July 2018, 24(2):429–440, doi:10.1016/j.celrep.2018.06.042.